just got out of another mid term. saw an unfamilur name in guild around the start of the log on event in rappelz, and saw an unresponsive tux a day or 2 ago in game. missing the guild redskies. A short example to though's that think anime's, and cartoon's are the exact same thing. anyone need help with measurment's? a boy waving to a girl while she's with her dad. espeacily if the dad's a redneck, or an overly protective father that will do a shotgun wedding if need be. previus attempt was in bng, this attempt of the same picture, but in png. to you harry potter fan's, did you ever consider this when reading the serie's? i'm not sick. i'm twisted. sick makes it sound like there's a cure. Which MMOs do we play other than Rappelz? mix-in-match my end. different game's are best played on certain system's do to there control scheme's. i guisse that's why i own, or have owned most every major gaming system ever made. it's howdy doody time again i see. is anyone on x-box 360/one, or playstation 3/4 that's connected to the net? i'm known as gehwesij over on xbox 360, and gehwesi over on ps3/4. just say you're a fellow redskies member if you send me a friend request there. magic is just science that you/we don't understand yet. so based on that logic, yes, i do believe in magic. finished my final's for this semester. 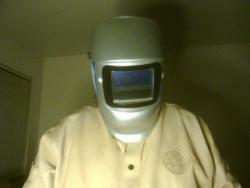 3 classes left until I have an a.s. degree in welding. been seeing you're post's at random on facebook subjunk. imysawocxywg is the newest mass spam bot ub redskies forum's.